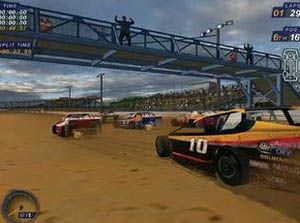 Dirt Track Racing 2 is the latest high speed racing game from publishers Infogrames and Australian developers Ratbag that features some of the most exhilarating dirt track racing to hit the world of PC Gaming. The basic premise behind Dirt Tracking Racing 2 is to race highly powerful and modified cars around a dirt track at dangerous speeds without letting any of your competitors get ahead of you. The game also contains a variety of different gameplay modes that include career mode, quick race and some great multiplayer modes for local area networks and the internet. The gameplay of Dirt Tract Racing 2 is perfect as uses a modified engine of the Powerslide game by Ratbag. The game also supports a variety of different gaming input devices such as keyboards, gamepads, joysticks and even steering wheels. I tested the game out on the most popular gaming device which is the keyboard and the cars handled perfectly around track. You actually felt like you were sliding on dirt and there was no lag between keyboard inputs and how the car responded. Once the keyboard was tested, I then proceeded to test the game with a Thrustmaster Firestorm Dual Power 3 gamepad that actually made the game handle almost like a console game. Although the keyboard was good, the right gamepad makes this game even better. 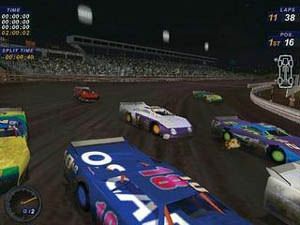 Graphically, Dirt Track Racing 2 is a little dated because it uses a modified engine of the Powerslide engine and although good, it does look a little old when compared to games such as Need for Speed Hot Pursuit or Grand Prix Challenge 2003. Fortunately the polygon count on the cars is fairly high which helps portray an accurate real world model of a racing car. The texture detail on the cars is also a little sparse as are the backgrounds in the game, but what do you expect from dirt car racing as in the real world, all these tracks are run by small privately owned operators and not by multinational corporations like the Formula One. There are also some special effects in the game such as dirt being blown back by the tyres and various engine effects such as smoke and sparks from the exhaust pipes. The developers have also managed to implement some great real world vehicle physics into the game such as the way cars are handled around the track and spectacular crashes. Another bonus of the graphics engine is that when the detailed is turned on high and with a high resolution of 1024x768, the game still manages to run at very acceptable framerates. The sound effects of Dirt Track Racing 2 are first class and it actually makes you feel like you are racing around a real dirt track stadium. The engine sound effects are filled with a strong bass that helps portray a realistic racing environment. Other sound effects include a variety of background noises and the sounds of dirt cars hitting each other at speeds in excess of 150 kilometres an hour. 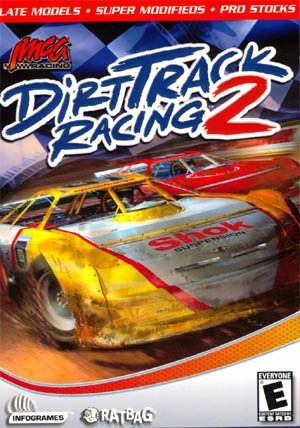 Musically, Dirt Track Racing 2 is missing a heavy metal soundtrack that would of fitted perfectly in the genre of this game. In conclusion, Dirt Track Racing 2 isn't a bad game but unfortunately it doesn't make it stand out above the rest of car games that are available on the market at the moment. 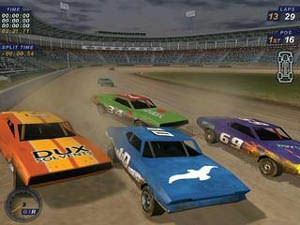 Graphically, the game is quite dated and it would probably only suit gamers who love the dirt car racing series or for racing fans who want something different. Check it out!